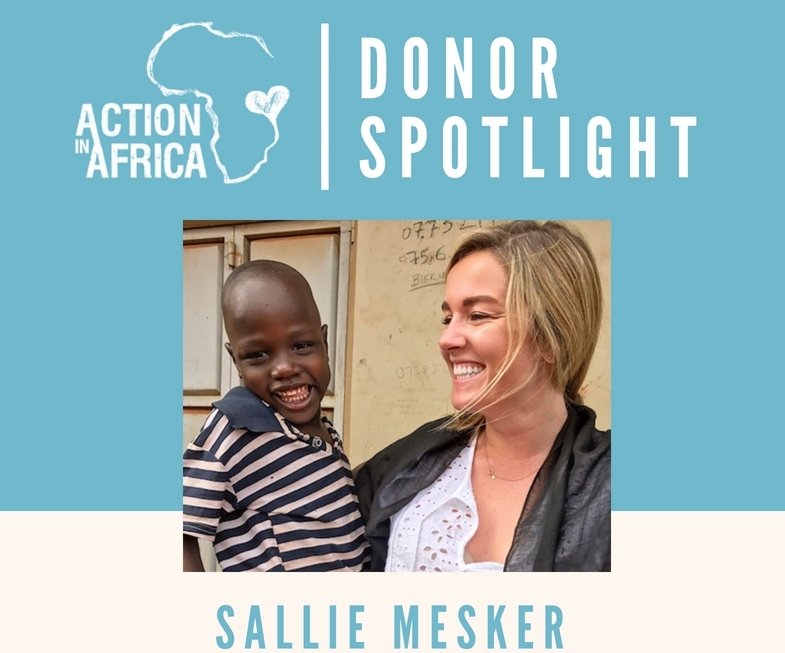 Sallie Mesker is one of Action in Africa's biggest fans. From financially supporting AIA's Special Needs Program to visiting us in Uganda, to co-hosting a fundraiser for in St. Louis to wearing our Muganda bracelets daily, it's hard to find anyone who loves Action in Africa more than Auntie Sallie. Sallie talked with Action in Africa's Executive Director, Sarah Nininger, and told us all about why she loves AIA. Read the full interview below! Sarah: Sallie, how and when did you first hear about Action in Africa? Sallie: I first heard about Action in Africa when I was in high school. One of my very best friends from growing up, Mimi Rogers, was and still is highly involved in the organization. From the second I heard about Action in Africa, I was intrigued. I had always wanted to go to Africa, but hadn't found an organization whose mission really resonated with me. Sarah: There are so many organizations doing incredible things across the globe, why do you pick Action in Africa to give to? Sallie: While Action in Africa has always had a very special place in my heart, it wasn't until I visited The Center in the summer of 2017 that I truly understood all of the incredible work that is taking place on a daily basis. All 14 full-time Ugandan employees live, eat, and breath Action in Africa. Each and every single day they are dedicated to creating a higher quality of life for the people of Nakuwadde. I find their passion and drive to be truly inspiring. Sarah: Would you recommend Action in Africa to potential new donors and why? Sallie: Time and time again I would recommend Action in Africa to potential new donors. To me, one of the most incredible aspects of this organization is how it is run by such a young group of people, Americans and Ugandans alike. The dedication and commitment of each individual on this team is enough to save a village (quite literally). Whether it is from the United States or right on site at The Center in Uganda, each morning these people wake up prepared to make a difference in the lives of the people of Nakuwadde. Sarah: Lastly, describe Action in Africa in three words. Sallie: Compassionate, Selfless, and Driven. Special thanks to Sallie for her unwavering commitment to Action in Africa. Join Sallie and support our work in Uganda today!